Dense fog and raw temperatures didn’t discourage over a hundred children and their families from coming to enjoy our annual Children’s Shopping Day held at the Pollard today. We were happy to see many familiar faces bringing their excited siblings who, in previous years, were too young to participate. Under the friendly and assuring guidance of our great team of teen volunteers from the National Honor Society at Lowell High, children browsed through the hundreds of donated items, got their selections wrapped and visited the cashier before being escorted back to their parents and guardians. Thank you very much to all of you who so generously gave your time, energy, and donations. A special thanks to the Pollard Library Foundation for their generous financial support Altogether our bake sale, book sale, and shopping event raised $1750, all of which will go to support the library and its staff dedicated to serving Lowell with quality community programming and library expertise. with many families returning from previous years to enjoy the holiday fun. for everyone’s enjoyment in the coming year. Terrific news! This past weekend we held our annual book sale and made over $2000 from book sales, bake sales, new memberships, and general donations. These proceeds will go directly into fully funding several of Pollard’s more expensive museum passes that come due this time of year, including the New England Aquarium, the Children’s Museum, and the Museum of Science. Thank you very much to those of you who donated so many wonderful, gently-used books – it was a banner year for book donations! – as well as to those of you who volunteered so much time and good cheer sorting books and making this year’s book sale successful. See you next year! Until then, we hope you’ll keep treating yourself to good cheap reads for sale in our ongoing book sale area located by the circulation desk on the library’s ground floor. Thanks to your generous gifts of time, donations, and money, our 3rd Annual Children’s Shopping Day was a fantastic success. One hundred seventy-five happy children walked out the door carrying bags loaded with presents for loved ones (as well as for themselves!). Meanwhile waiting in the lobby, grown ups bought goodies at our bake sale table, filled a bag of books for five bucks, and bought beautiful Audubon bird calendars and stationery from the PML’s Foundation. From the moment we opened our doors at ten o’clock until well into the late afternoon, our shopping showroom stayed packed with people. Our gift-wrappers nearly ran out of supplies, while our cash box grew steadily. 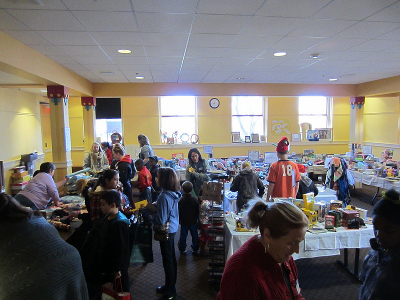 Altogether our book sale, bake sale, and gifts inside made over $1,600. On behalf of the Friends of the Library, I want to say thank you very much for helping make this library event a lot of fun for so many children. WHEN: Special Preview Night (for dues-paying Friends only): Thursday, May 15, 4-8 P.M.
Open to the general public: Thursday, May 15, 8-9 P.M.
Friday, May 16, 9 A.M. – 5 P.M.
Saturday, May 17, 9 A.M. – 3 P.M. Donate your unwanted books and other media! We will accept hardcover and paperback books for all age groups, audiobooks (both cassettes and CDs), music CDs and DVDs, movie DVDs, and computer software/games. Sorry, we cannot accept magazines, videotapes, or any items that are tattered, musty, or mildewed. Please drop off your donations at the library between 10 A.M. and 1 P.M. on March 29, April 19, May 3, or May 10, or email Stacie Caldwell at friends@pollardml.org to arrange a special drop-off time. Thank you! 2014 Meeting of the Minds was a great success. The Power Disrupters, last year’s winning team, captured first in the Science and Math, and the US History and Geography categories. The Pollard library’s team of librarians took first place in the Arts and Leisure category. The high school teams gave them both a run for their money. Great job Teen Friends! Our second annual Children’s Shopping Day last Saturday confirmed our observation from last year’s event: children really like to shop, too! Once again, we offered over a hundred children the opportunity to shop on their own or with the help of a very caring and gentle teenage volunteer and get their gifts wrapped to take home for the holidays. After three hours of shopping exclusively set aside for kids, we tried something new by opening the rest of the afternoon to adult shoppers as well. Shopping was brisk and by the end of the event, there was nothing left! Serenaded by the the Neverly Brother’s live acoustic guitar music, families came in from the cold to also buy raffle tickets for an iPod, snack on homemade goodies from our bake sale, and discover bargains at our book sale. In total, the Friends made over $1,600, all of which will support the Pollard Memorial Library. Thank you all again for your generous gift donations, your time volunteering, and your constant support. You made Children’s Shopping Day as enjoyable as last year’s Day, and we hope to hear from you again next year. Many many thanks to the Members, volunteers, bakers, library staff , Executive Board and supporters of all stripes who made this year’s Annual Book Sale a great success! The Friends raised almost $2,600, all of which will be used to fund the museum pass program and the many events and programs we support throughout the year. This is a record for the past few years and it was wonderful to have it back at the library. It gave us a chance to meet so many patrons as they browsed and bought everything from hardbound fiction to children’s books to baked goodies to a chance or two to win one of our raffle prizes. Daniel Hamilton was the lucky winner of the 50/50 raffle, and Oscar Ortega, Helen Blaschke and Donna Richards each won a basket of books. We hope everyone enjoyed the sale and look forward to seeing you at the next one. Until then remember to check out the book carts on the ground floor where the Friends always have books for sale. With the gentle and assuring help of our cadre of teenage volunteers, our young shoppers bought gifts for their loved ones, got their treasures wrapped and gift tagged from a dedicated team of wrapping assistants, and headed out the door in time to enjoy the City of Lights Parade. Altogether the Friends made over a thousand dollars, an amount that has exceeded our expectations and made us look forward to transforming this experience into an annual event. Thank you all again for making the event such a memorable one.